*Only $53 for self collection, pay $73 online, will refund $20 upon collection. *Self-collection only available within working hrs from Mon-Sat except for public holidays @12pm-7pm. 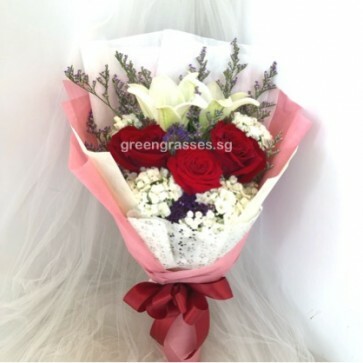 Hand Bouquet of 2 White Lilies & 3 Red Roses.